First Floor 2089 sq. ft.
Width 61 ft. 8 in. Depth 50 ft. 4 in. Approx. Height 21 ft. 10 in. Fashioned with Sunbelt flair, this Florida style home plan is sure to catch your eye. Large windows, classy arches and a stucco façade add to its fantastic street appeal as delicate stepped trim adds stately elegance. Inside, you’ll find and open floor plan topped with 10’ and 12’ ceilings throughout lending to an open airy feel. The formal living and dining areas flank the foyer brining tradition back to house design. Built-ins surround the family room fireplace accenting this comfortable gathering place. Glass sliders open to the covered terrace expanding the living areas outdoors. Gourmet and amateur chefs will think the kitchen is a dream with its culinary pantry, bar seating and adjoining nook. Mitered glass draws the sunshine in and affords beautiful rear views. For your convenience, the laundry room and access to the 2-car garage are thoughtfully placed near the kitchen making multi-tasking a snap. Extensive use of glass in the master suite delivers radiance while showcasing a sumptuous bath complete with garden tub and step-down, “doorless” shower. 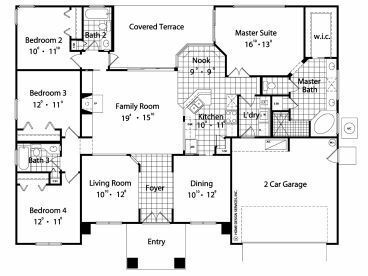 On the other side of this split-bedroom design, a pocket door allows privacy to Bedroom 2, perfect for the in-laws or a guest with private pool bath. 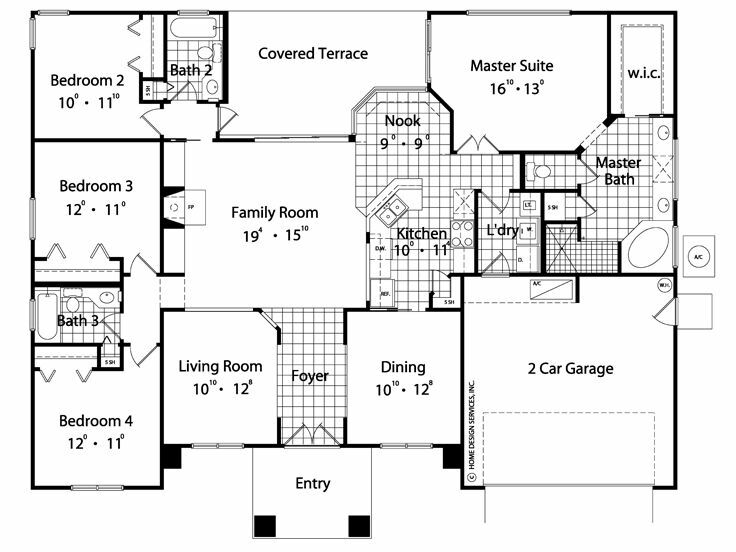 Bedrooms 3 and 4 share a hall bath and enjoy ample closet space. One of these bedrooms could easily serve as an office or den if needed. 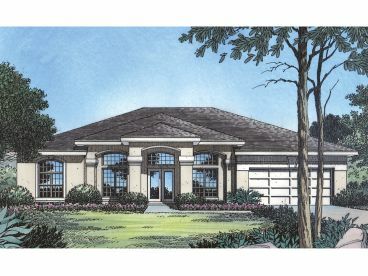 Delivering usable space, sensibility and style, this Mediterranean ranch home plan offers plenty of features on your wish list of favorites.